ORLANDO, FLA — BENCHMARK®, a global hospitality company, announces plans to open The Grove Resort & Spa, an 878 room all-suite resort in Orlando, located on Lake Austin and just minutes from Walt Disney World®. The Grove Resort & Spa will bring a new type of hotel destination to the area with an expansive 106-acre blueprint that incorporates a portion of Central Florida’s conservation grounds. Its world-class, family-friendly water park and amenity package will include a dual rider surf simulator, a winding lazy river, four swimming pools, and a variety of dining options that include full-service restaurants, bars, and a large scale grab-and-go marketplace. Billed as the largest development of its kind currently underway in Orlando, The Grove Resort & Spa is scheduled to open its first phase in February 2017 with 184 two and three-bedroom residential-style guest suites. Uniquely set only three miles from Walt Disney World® Resort’s Western Way entrance, The Grove Resort & Spa will harmoniously blend connectivity and seclusion. The hotel will offer convenient access to Orlando’s prime entertainment locales and iconic parks, including Magic Kingdom® Park, Animal Kingdom® Park, Epcot®, Disney’s Hollywood Studios®, ESPN Wide World of Sports Complex, SeaWorld Orlando®, Universal Orlando®, shopping, dining, and entertainment at Disney Springs, as well as LEGOLAND® Florida (Winter Haven); luxury shopping is also located nearby, with stores that include Gucci, Valentino, Bottega Veneta, and more. 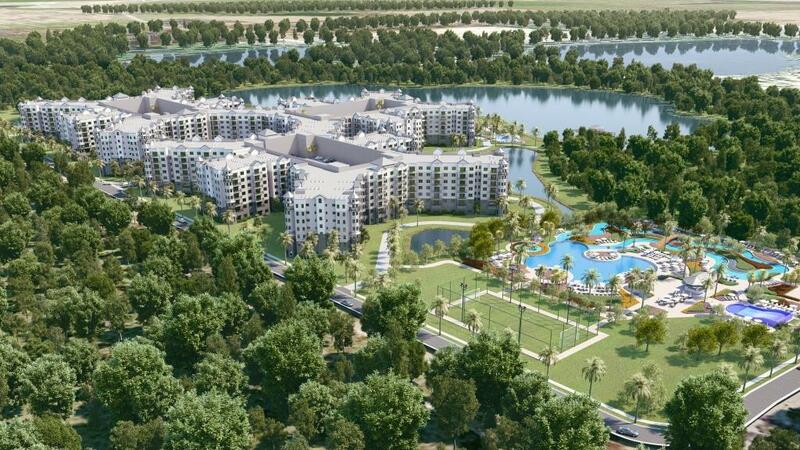 The Grove, however, will also be a retreat from the boisterous pace of the theme parks and other area activities with its natural marsh, wooded landscape, and waterfront setting – all hallmarks of the Florida panorama. Despite the resort’s immediate access to some of the area’s top attractions, The Grove’s myriad activities will establish it as a destination in itself, thoughtfully matched with accommodations ideally suited for families and groups. The resort’s generously sized two and three bedroom suites, ranging between 1,264 square feet (117 square meters) and 1,544 square feet (143 square meters), will provide spacious living and dining areas, full kitchens, multiple bathrooms, screened balconies, and full-size washers and dryers. Dressed in hues and materials that draw inspiration from the resort’s natural surroundings, The Grove’s suites will simplify the concept of family travel with its profusion of convenience-minded, in-room amenities. Guests will find endless opportunities for entertainment outdoors: at The Grove’s Surfari Water Park, children will splash through an interactive water structure with multiple slides; families will float down more than 725 feet (221 meters) of lazy river; and nearby lounge chairs and umbrellas will offer shade from the warm Florida sun. A trio of neighboring swimming pools, known as The Springs, will provide additional areas for play and relaxation, while adventurists will be challenged with a ride on The Grove’s dual rider surf simulator. For those looking to lounge, a zero-entry pool with reclining chairs will be located on the main deck, while covered cabanas can be found in a secluded area next to Lake Austin. Lake Austin Pier will be home to a selection of watersports, paddle boats, and fishing. An abundance of other activities will also be available across the resort. The Grove’s Escape Spa will offer a full service menu inclusive of body and facial treatments, manicures, and pedicures; a 2,000 square foot (186 square meter) fitness center will house cardiovascular and strength training equipment flushed with natural light from the space’s floor to ceiling windows; and Hoopla, a children’s game room, will provide indoor recreation for a variety of ages. Dining at The Grove will include the 221-seat, indoor/outdoor restaurant, Valencia, serving Spanish, Italian, and French-inspired dishes for breakfast, lunch, and dinner. Longboard Bar & Grill, located at Surfari Water Park, and Springs Bar & Grill, located at The Springs Resort Pools, will both serve traditional bites such as hamburgers, chicken wings, and stone brick oven pizzas with all ingredients fresh, in-season, and locally grown. The Grove’s large-scale grab-and-go, Alfresco Market, will present a selection of hot and cold self-serve food, gelato and ice cream, a barista bar, a deli with fresh-cut Boar’s Head meats and made-to-order sandwiches, as well as grocery-style items ideal for stocking the in-room kitchen. The Grove Resort & Spa will welcome destination weddings, family reunions, meetings, and other social and corporate events. With 6,000 square feet of flexible indoor space, and poolside, lawn, and garden alfresco venues for intimate meetings or large groups, The Grove will accommodate up to 300 people with on-site catering and audiovisual support available. The Grove Resort & Spa is owned by a joint venture between certain affiliates of Westport Capital Partners and BTI Partners, with BTI Partners as the development partner. Houston, Texas-based BENCHMARK®, a global hospitality company, will manage the property as part of its signature Benchmark Resorts & Hotels portfolio. The Grove Resort & Spa is located at 14501 Grove Resort Avenue, Orlando, Florida 34787. Toll free: 1-844-203-0209. Local: 407-545-7500. www.GroveResortOrlando.com. The Grove Resort & Spa will open in Orlando, Florida in February 2017 as an expansive 106-acre hotel destination located just minutes from the west entrance of Walt Disney World®. Set on Lake Austin and amid a portion of Central Florida’s conservation grounds, The Grove will become a sanctuary from the boisterous pace of the outside world, neighboring theme parks, luxury shopping, and entertainment centers. 878 two and three bedroom residential-style suites with full kitchens, full-size washers and dryers, multiple bathrooms, and screened patios will offer guests the comforts of home, while the resort’s hearty collection of amenities will deliver the luxuries of a full-service resort. Four swimming pools and the Surfari Water Park will be a focal point of The Grove experience, with its interactive water structure with multiple slides, a lazy river stretching more than 725 feet, and a dual rider surf simulator. Guests will also enjoy a selection of watersports at the resort’s Lake Austin Pier, an intimate spa, fitness center, and a children’s game room. Dining options will include the indoor/outdoor Valencia restaurant, Longboard Bar & Grill and Springs Bar & Grill at the pool areas, with additional food options available at the large scale grab-and-go, Alfresco Market. 6,000 square feet of flexible space will be available for weddings, family reunions, and other meetings and special events. The Grove Resort & Spa is managed by Houston, Texas-based BENCHMARK®, a global hospitality company. For more information, please visit www.GroveResortOrlando.com. Follow The Grove via Facebook.com/thegroveresortorlando and on Twitter and Instagram at @thegroveresort. Benchmark Resorts & Hotels® features the finest in preferred accommodations, exceptional food & beverage, recreation, and superior meeting facilities throughout the United States and the Caribbean. Renowned for enchanting destinations, incomparable service, and for creating unforgettable memory-making experiences, they are a signature portfolio of BENCHMARK®, a global hospitality company®, which has been a leading US-based hospitality management company for nearly 40 years. Many select Benchmark properties are certified by IACC, the association that represents the finest meeting venues and services globally, and many have also been recognized with the coveted Benchmark Conference Centers® certification of meeting excellence.